The Mrs. Yoy Blog: What a cheese ball! Little E turned 19 months yesterday. He is growing up so fast. I remember when Big E was 19 months. I was about 8 months pregnant with Little E. Hmm...that's about all I can remember. I can not recall a single milestone for Big E.
I really want to remember when he started tearing away bites from, for instance, a string cheese. I think and think and think. Nothing pops in my head. All I remember is being fat and hot and b*tchy when Big E was 19 months. He went days on end without a bath because I couldn't bend over with my belly. Bad mommy moment, I know. Today, I gave Little E a whole string cheese to waddle around the house with. He was standing at the refrigerator begging like a dog, so I figured how much harm could I do? He either takes bites or shoves the whole thing in his mouth and slowly dissolves it. After a few minutes the cheese was gone. Well, that worked. So maybe he IS old enough to take bites. Next up on our exciting schedule, a goodwill run. I scoop up the Yoys and throw them in the big red bus. As I was buckling Little E in, he opened his mouth and out came the most perfect, round, warm cheese ball I've ever seen. This thing put fancy cheese balls I've been served at past parties to shame. It was amazing. It was like his mouth was its very own Easy Bake Oven. How in the hell did Little E keep that in his mouth, so perfectly formed, for the ten minutes it had been since I first handed it to him? 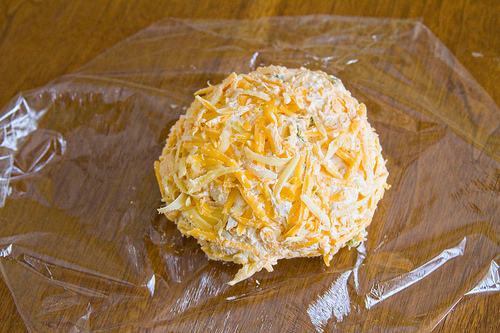 I was now holding in my hand Little E's homemade cheese ball. It was more than I could handle. Literally. Seriously. This is about the size of what Little E birthed from his mouth. Barf.